Moving to Sydney - The Ultimate Kids Guide! Moving house is an arduous task even for us grownups, who make the decision to do it in the first place! Spare a thought then for your kids - they get told they are moving house, leaving friends and going to a whole new unfamiliar place without even having a say in the matter. Obviously we take our kids wishes on board but it’s not always realistic letting them decide where we are going to live. Sometimes though, all that is needed is to turn the focus away from all the negatives of moving and highlight all the positives of moving. Hey Kids! If you happen to be moving to Sydney soon then you are really really lucky! There is so much cool stuff to do in Sydney you won't have any time to feel homesick and all of your old friends are going to be mega jealous when you tell them what you've been up to in Sydney. Here's some ideas to get you going so grab an adult and go check out your new hometown! This place has something for everyone and you can spend the WHOLE day here and never get bored. Have you ever wished you could hop inside a bubble and walk on water - well you can here! There are two awesome playgrounds - one for little kids and one for older kids (and Mum & Dad will love that they are enclosed). There is a flying trapeze, bungy trampoline, bouncy castles, an IMAX theatre, 10 pin bowling, a skate park, and loads of shops and cafes. Everyone is going to love it here! If you are into space and love movies - then this is the place to go. There are loads of different 3-D space short movies to see and when it's 3-D you'll feel like you're really travelling through space. Compare the sizes of the planets, stars, moons and galaxies and marvel at how big and endless the universe is. Journey across Mars and see spacemen at work. This is one that Mum & Dad will find interesting too. Near Manly at Freshwater Beach there is a place to learn to surf that is funky and very cool - Surf Skool. 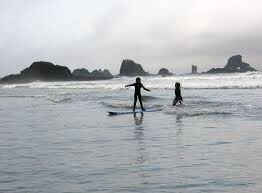 You can learn to surf in a private lesson or join a group. Their courses are for ages 8 and up and you'll learn loads of extra stuff like surf culture, how to ride and surf a wave, paddling techniques, beach awareness and even how to wipeout or fall off (in a safe way!). Sydney's warm sunny climate means it's perfect for going to the beach and there's no better place to learn to surf than Sydney. If you love the thought of having an adventure then these two activities will be great fun. For the clue trails, you choose a clue trail (there are 5 to choose from) and download a map. Then grab a pencil and get ready to follow the clue trail and try and solve the message at the end. The amazing chase is similar but this time you are on a bike. Challenge your friends to a chase around the park and use a map to locate checkpoints and answer questions and solve puzzles at each one. If you don't have a bike you can hire one at the park. For kids who are into video gaming this is a happy place to be. Thinkspace is the Powerhouse Museum's digital learning centre. You can participate in workshops where you can learn about game coding, graphics and sound. If you've always dreamed of running away and joining the circus then here is your chance! With the safety of a harness and a net underneath you, you can learn basic trapeze positions then progress to the thrill of flying and learning the real moves such as the knee-hand, the back flip and the catch. Anyone, five years and over can give it a go. There is so much to do in the heart of city and if you've never been before you are spoilt for choice with what is on offer to see. You could begin by taking the lift to Sydney Tower Eye, the city's tallest building standing 250 metres high - if heights don't bother you, you may want to try a walk on the glass platform outside the tower (NOT for the faint hearted). Next stop, the Opera House, it's a pretty amazing building to see for the first time. Then if you're up for it, you may want to climb the Sydney Harbour Bridge. At Darling Harbour you can stop to refuel at one of the many cafes before visiting the Australian National Maritime Museum where you can explore the many spectaculor historical vessels including a submarine. No doubt, even if you've never been to Sydney, you'll still recognise that big smiling face that is the entry way to Luna Park. It's been around since 1935 and is a park created just for FUN. There's rides suitable for everyone from toddlers, through to teenagers and even Mums & Dads. Going on the restored Ferris Wheel is a 'must do', check out the amazing views of the harbour! Of course, no visit to an amusement park is complete without visiting the shide show games and eating hot dogs, fairy floss and ice-cream! Now, before Mum & Dad start panicking that you are going to be jumping out of a plane - you need to let them know about the awesome new activity. It's called iFly and is actually completely safe indoor skydiving. If you've always wondered what it feels like to fly like a superhero then this is the activity for you! Experience the exhilaration of flying with the assistance of massive wind generators that lift you effortlessly into flight and once you are used to the sensation you can start practicing your aerobatics! For your next interstate move with your family, see how easy it can be moving the self pack way with a moving container. We can deliver a 20ft shipping container to your door, you pack it then we transport it to your new home. It couldn't be simpler and you could stand to save hundreds or even thousands using a trusted cheap removalist such as Budget Self Pack Containers. Call 1300 659 221 today for a free quote or get one online here.